Biokult is the most effective probiotic available, containing 14 strains of beneficial bacteria at concentration of 2 billion probiotic organisms per capsule. Biokult is imported and sold in New Zealand by Nature Foods NZ. 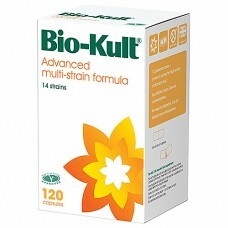 Bio-Kult is the probiotic used by Dr Campbell-McBride with most of her GAPS™ patients. It is a 14 strain probiotic, designed to help the digestive and immune systems, and formulated by a team of doctors, nutritionists and scientists dedicated to advancing the research and use of probiotic health supplements. The healthy body naturally hosts trillions of beneficial bacteria. Amongst other things, they help to support and maintain a strong immune system and a healthy digestive system. Today’s lifestyle of stress and poor nutrition can compromise these essential functions. It is of fundamental importance that we have an adequate level of these probiotic bacteria in our bodies at all times. Other ingredients: cellulose (bulking agent), vegetable capsule: hydroxpropyl methyl cellulose. Free from gluten, sucrose, yeast, salt, additives, flavourings and colourings. May contain traces of soy and traces of milk products at a level which would not affect lactose intolerance sufferers. Bio-Kult capsules can be opened and mixed into food or cold drinks if desired. They do not require refrigeration. The capsules only look tiny, but they are very powerful. We recommend you start by opening up a cap and having just a pinch. Lifestyle changes, stress, medicines and disease can sometimes deplete our beneficial gut bacte..